Sir Peter Warren, who built Westbury House as a Palladian mansion. Sir Peter Warren built the Palladian house at Westbury in the 1740s. It was burned down in 1904. 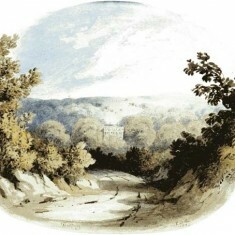 The 4th Viscount Gage’s younger brother Thomas William Gage lived at Westbury. He was born in 1796, and married Arabella Cecil, daughter of T. St. Quintin of Southampton. 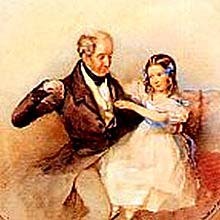 They had two children Arabella Elizabeth, who in turn married her cousin, Edward Thomas Gage in 1856, and their son William born in 1828, died at the age of 18. During the 18th and 19th century, Westbury House was built and owned by two colourful and prosperous families, both members of the Irish peerage, the Warrens and the Gages. These pictures include portraits of some owners, and illustrations of the house and grounds. Westbury had been purchased by Admiral Sir Peter Warren, K.B. 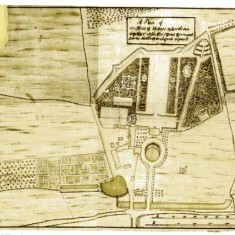 in the early 18th century. He was an Irishman by birth who obtained his commission as a lieutenant in 1722, and from that time his promotion was rapid. 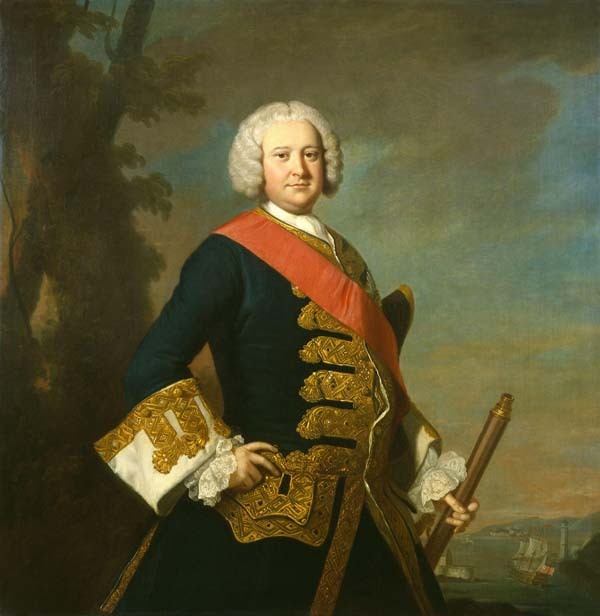 He aided the New England colonies in the war with France, and in 1745, with General Pepperell, captured Louisbourg, as a reward for which he was made rear-admiral of the Blue. After the capitulation of Louisbourg Warren captured three French ships valued at £1,000,000, and from his share of the spoils of war realized a large fortune. In 1747 he won a great naval victory off Cape Finisterre, and for his gallantry on this occasion was made Knight of the Bath. On his retirement from active service in 1748 he received many civic honours, being elected M.P. for Westminster in 1750. His grand-daughter and heir Susanna Maria married her first cousin Major-General Henry, third Viscount Gage, in 1789. 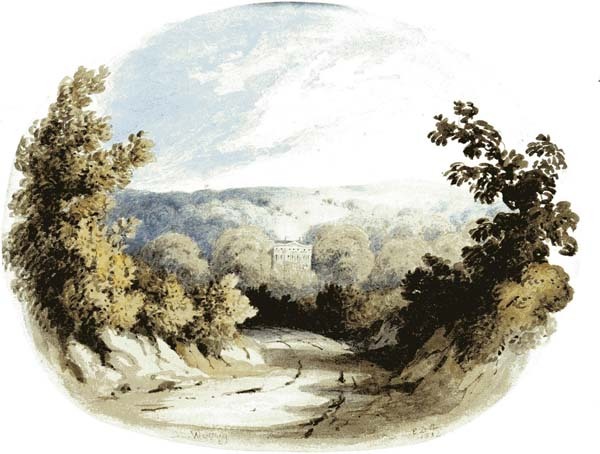 The Gage family lived at Firle Place, East Sussex, and for the next fifty years, Westbury was the family’s second home. The Gage family descends from John Gage, who was created a baronet, of Firle Place in the County of Sussex, in 1622. 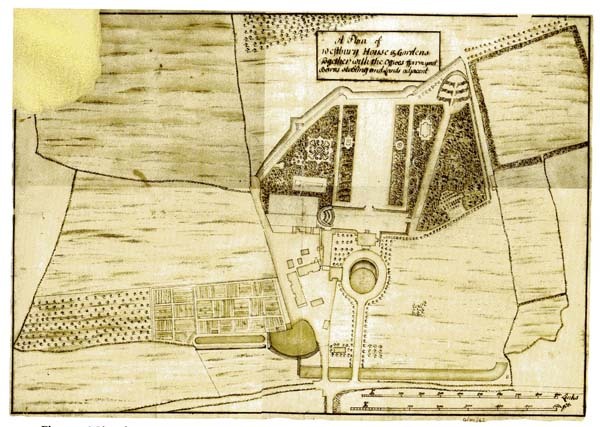 Thomas Gage, of Highmeadow, was created Baron Gage of Castlebar and Viscount Gage of Castle Island, under the Irish Peerage, in 1720. In 1744 he also succeeded his cousin as eighth Baronet, of FIrle Place.His great-grandson, the seventh Baronet, represented Seaford in Parliament. He was succeeded by his first cousin, 1st Viscount Gage, the eighth Baronet. He sat as a Member of Parliament for Minehead and Tewkesbury and also served as Governor of Barbados. In 1720, 24 years before succeeding in the baronetcy, he was raised to the Peerage of Ireland as Baron Gage and Viscount Gage. Lord Gage was succeeded by his eldest son, the second Viscount. He represented Seaford in the House of Commons and served as for many years as Paymaster of Pensions. In 1780 he was created Baron Gage, of Firle in the County of Sussex, in the Peerage of Great Britain, with remainder to heirs male, and in 1790 he was made Baron Gage, of High Meadow in the County of Gloucester, also in the Peerage of Great Britain, with remainder to his nephew and heir presumptive Henry, the eldest son of his younger brother, the aforementioned Sir Thomas Gage. On Lord Gage’s death in 1791 the barony of 1780 became extinct while he was succeeded in the barony of 1790, the baronetcy and the Irish titles by his nephew Henry, the third Viscount. He was a Major-General in the Army. As of 2010 the titles are held by his great-great-great-grandson, the eighth Viscount, who succeeded his elder brother in 1993. Archive. The original paintings are at Firle Place.